Well as I write this next Blog sitting in my seat on Flight VS200 on the Hong Kong to Sydney leg of our journey to Australia with Shane, we are still coming to terms with the amazing news that he has been asked to play for the Lions once again, this time in Australia against the Brumbies on Tuesday evening, Aussie time. It fabulous news for Shane and his family and he is really excited I can tell you! I met up with him at Hong Kong airport with Shane flying there from Tokyo and myself from Heathrow. Its Roy of the Rovers stuff isn’t it? Shane gets picked up by the Lions when we arrive in Sydney and taken straight to a training session where he will have to get up to speed pretty quickly!! The selection of this particular team to play in the midweek match of the First Test was always going to give the indications of the Test team especially after the performance and selection of the Waratahs match. Again, injuries aside the Lions are showing great strength and character and the performances of Heaslip, Croft and Warburton along with the selection of Tipuric, O’Brien and Falatau for Tuesday gives us all a bit of an insight into how Warren is thinking. However, on Tuesday night the selected players have a great opportunity to just tweak the imagination and I’m really looking forward to that one, especially now my little partner is playing. It will be interesting to see the new centre partnership that has arrived – Twelvetrees and Barritt, especially with the injuries to Roberts and Tuilagi as well as Wade on the wing and Hogg again up front. The battle for the lock bench spot will depend on how Gray or Evans go – both in good form on tour – and its last chance for Best and Ben Youngs to see if they can make the Test 23. 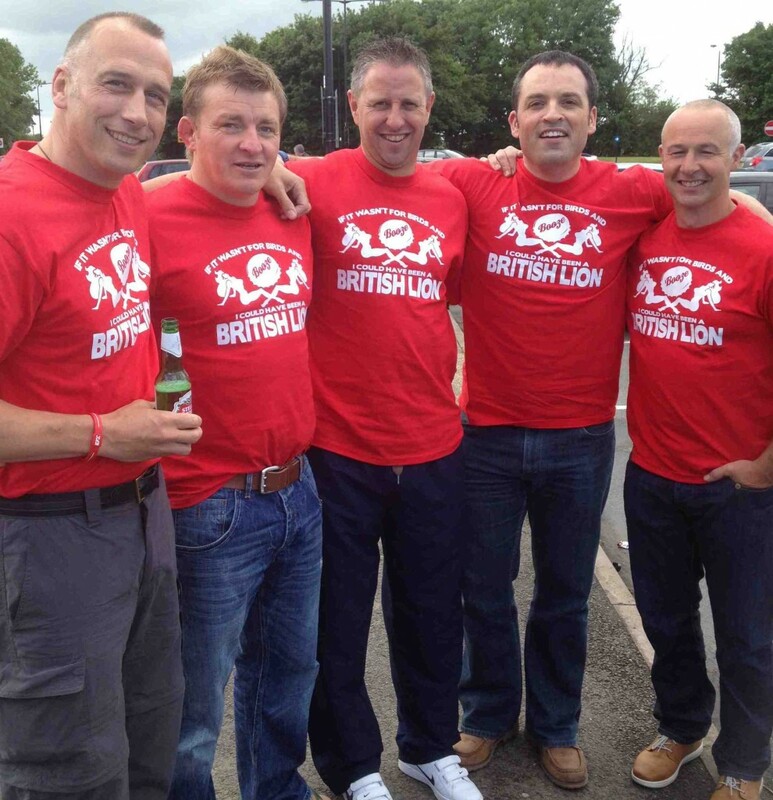 Lions Supporters Howard, Brownie (Tondu), Jason (Maesteg), Dai (Port Talbot) and David (Bridgend). It’s a busy week for us aside from the Brumbies match for Shane. We’ll be recording various things for ‘Rugby Nation Down Under’ and TalkSport as well as meeting up with former England cricket captain and now Mixed Martial Arts fighter Adam Hollioake. There’ll be a visit to the Gold Coast Titans Rugby League team and the arrival of the Venatour tour party to Surfers Paradise where we are based for the week. We look forward to catching up with you on Tour!